On Saturday morning, I was feverishly riding my spin bike to my usual destination, Nowhere, when I observed that the sky outside was a vibrant blue. The temperature that day eventually reached a high of 53. If one disregarded the piles of dirt-stained melting snow, the weather was spring-like and perfect for a genuine lame adventure featuring my favorite band, the Beatles. The evening before I was quaffing suds and chowing down bar snacks with my pal, Coco. Me: What do you think of the Beatles? Earlier that week I mentioned the Fab Four to my bud, Milton. Milton: If I hear any more about the Beatles, I’m going to become a serial killer. Milton is sick of the avalanche of stories and specials commemorating the fiftieth anniversary of the Beatles coming to America this month. The combination of common sense and self-preservation suggested that I resist asking either of my two closest friends to join me for a visit to the New York Public Library for the Performing Art’s exhibit, Ladies and Gentlemen … The Beatles! It runs through May 10 and the price is my second favorite four-letter f-word: free. This exhibit is a touring exhibit (it opens in Minneapolis on June 5) so it may eventually head to a city near you. It was curated by the GRAMMY Museum. It is a treasure trove of Beatle history, artifacts, memorabilia, videos, interactive stops (none of which I participated in because they required wearing communal headphones that activated my inner germaphobe), an opportunity to take a recorded drum lesson from Ringo (I passed) and a living history booth where visitors are encouraged to record their Beatle memories. No way would I subject myself to the humiliation of admitting on tape that even though I was born with a tin ear and can only drop a tune, I fantasized about being a Beatle myself. Something I learned from this exhibit that I didn’t know before, was that George Harrison, accompanied by his brother, Peter, had visited the US for a few weeks in mid-September 1963. At that time, the four band members were taking a vacation. Paul and Ringo hightailed to Greece. John and his wife, Cynthia, bolted to France. George visited his sister, Louise, who was living in exotic (cough) Benton, Illinois. While there he bought a Rickenbacker guitar. This Rickenbacker 425 guitar was originally red. George had it lacquered black to look like John Lennon’s. Before returning to the UK, George visited New York City, and was able to pound the pavement in pre-Beatlemania anonymity. 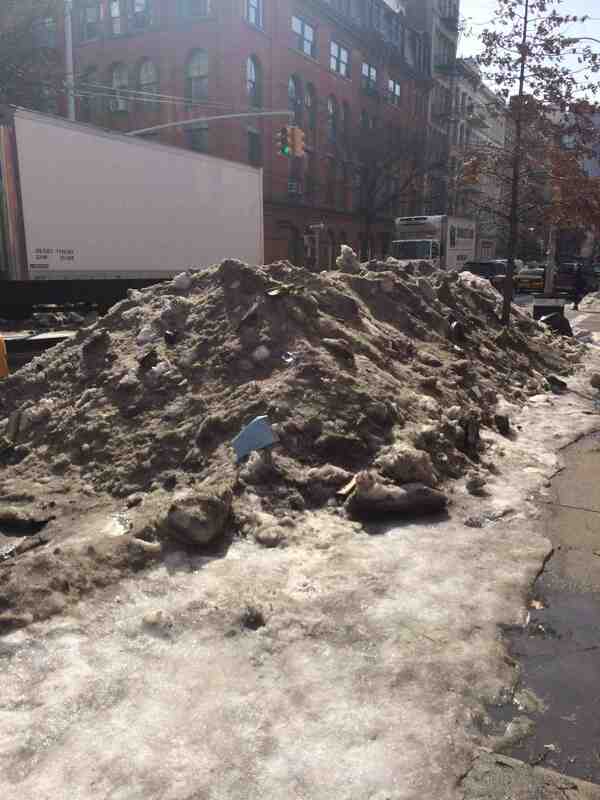 New York these days (photo by Coco). 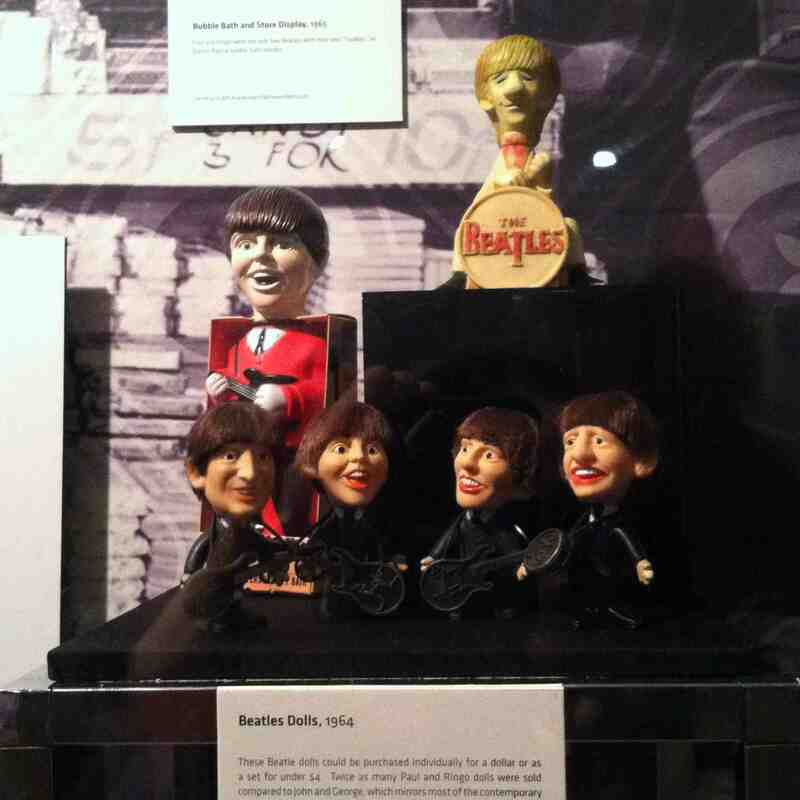 Something else that I found interesting is that although it was teenage girls that initially went hysterical over the band, the artifacts on display were from vast Beatle collections maintained by Beatle worshipping guys in their fifties and sixties. I don’t know what this means, but I am sure some of you, my more intrepid followers, might be pregnant with opinion about this. Eventually, the program for this exhibit might be considered a collector’s item. It is also free. Soon more valuable than my company’s 401k? When I attended, about half the crowd was composed of boomers in their fifties and sixties, waxing nostalgic, but I didn’t see Coco’s parents. I overheard a few of the more demented ones softly humming the Beatle songs playing on the sound system. There were several members of the younger generation soaking it in, too. A popular spot for parents to take pictures of their small fry was in front of a typical Beatlemaniac’s bedroom back in the day. Make the bed queen sized and I’d be okay with living there now. I shot a few hundred photos with my iPhone, but most did not turn out very well. Naturally, that does not stop me from posting the best of the worst here as a small sampling of what’s on display. Thimble-sized spender me enjoyed this exhibit so much, I was compelled to stuff a Washington into the donation box upon exiting. If you’re in or near New York City, I urge you to visit this really big show. It rates the Lame Adventures greasy fingerprint seal of endorsement. Library’s outside entrance: yeah, yeah, yeah! 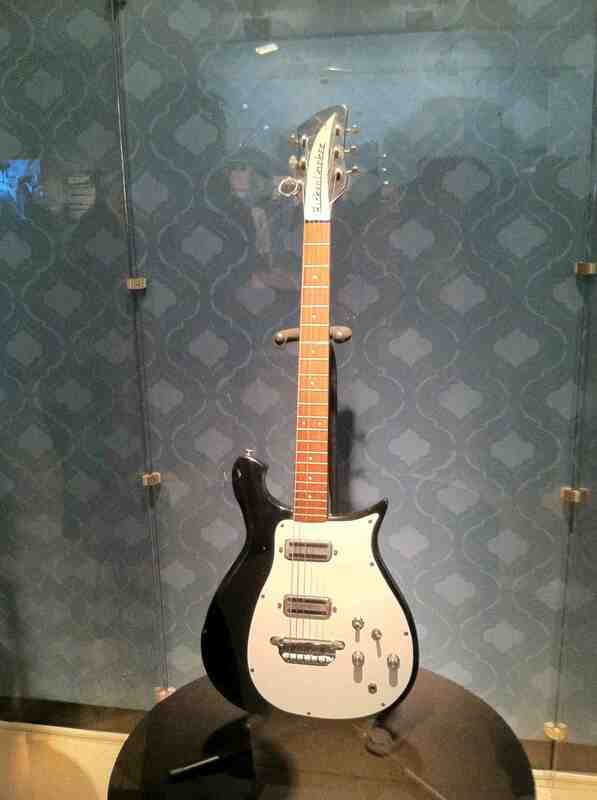 The Beatles’ instruments upon entering the exhibit. Ray Charles (fg) and James Brown (bg) suits; guys who influenced the Beatles. 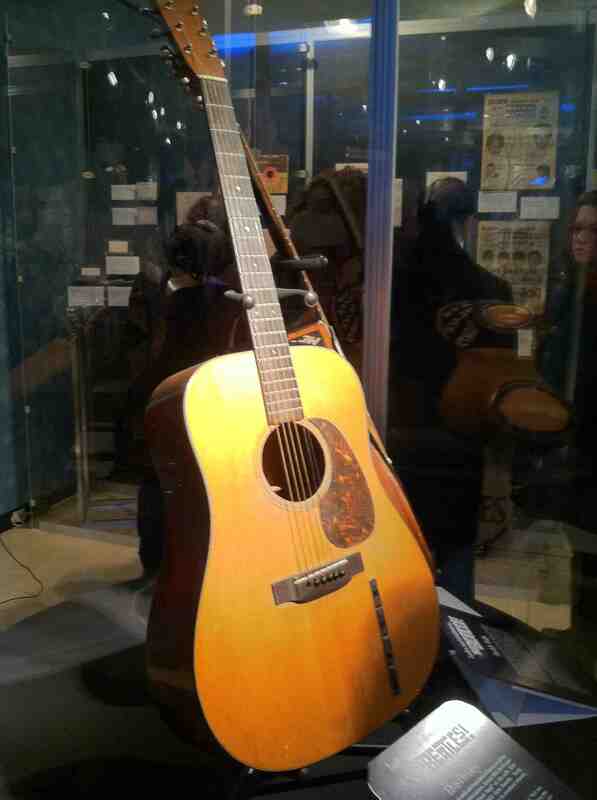 Elvis’s guitar. The Beatles were big fans of his, but he was in no hurry to meet them. 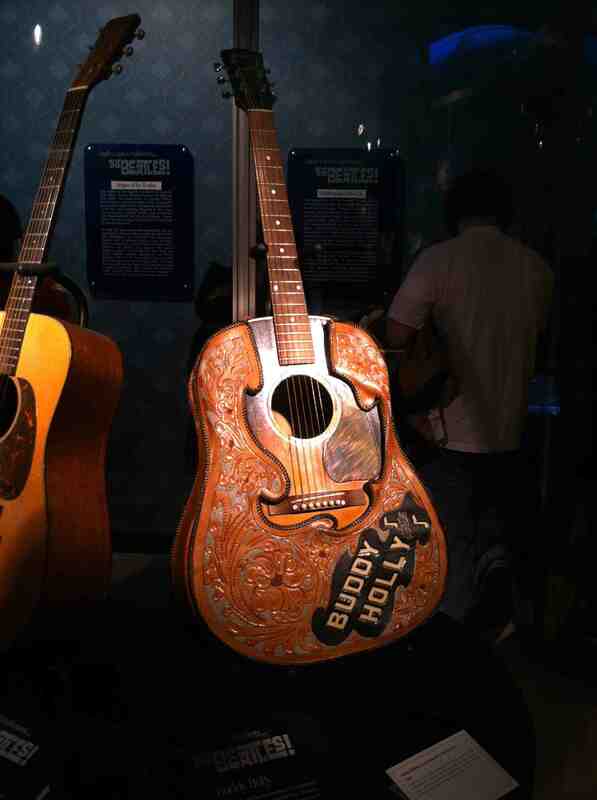 Buddy Holly’s wild guitar. The Beatles loved this rock legend. So do I. 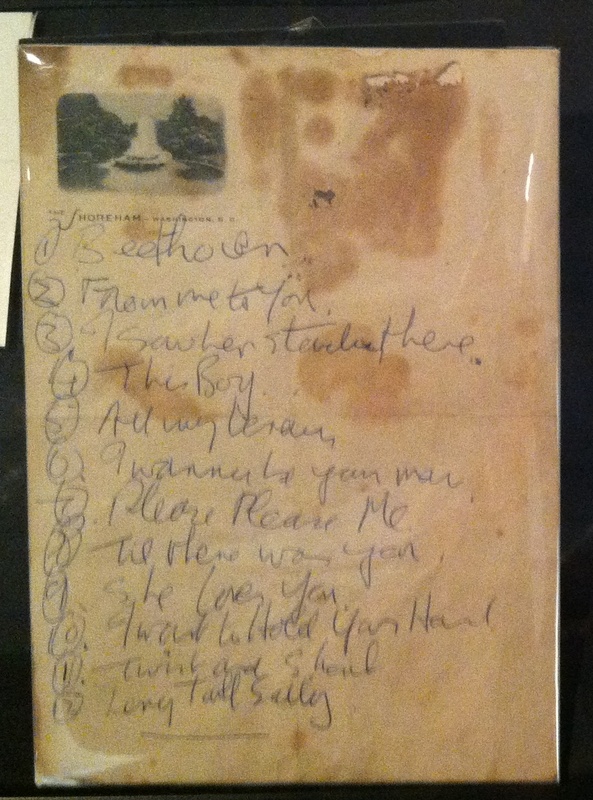 The set list John Lennon wrote for the Beatles first concert in the US. Song lyrics Paul McCartney threw in the trash that a hotel maid retrieved. Probably worth a million dollars today. 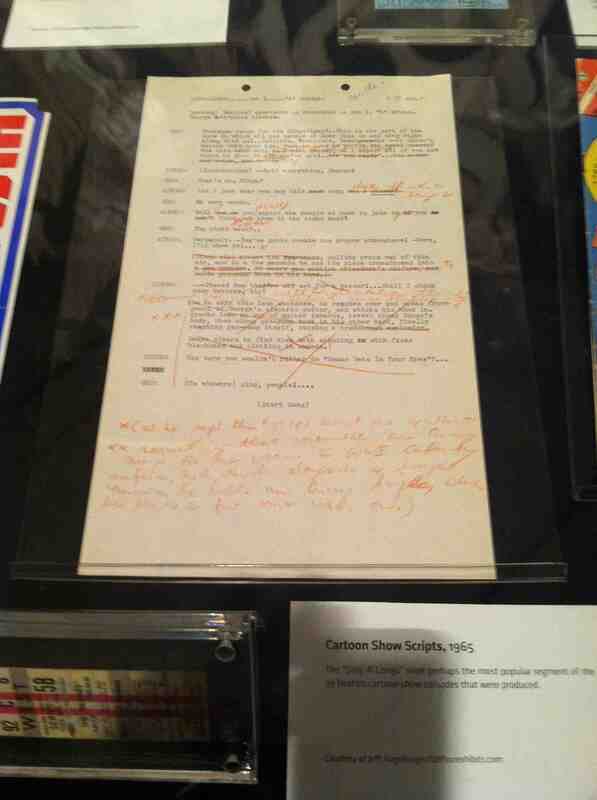 Script for one of the 39 episodes of the Beatles cartoon series that ran on ABC. I was addicted to this show. Pepsi product placement circa 1964. 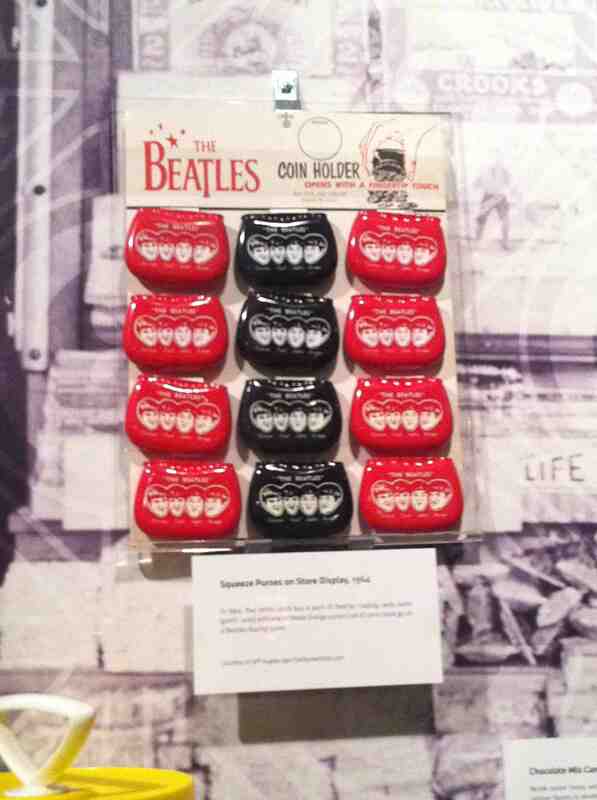 Each Beatle was given one of these transistor radios upon coming to America. 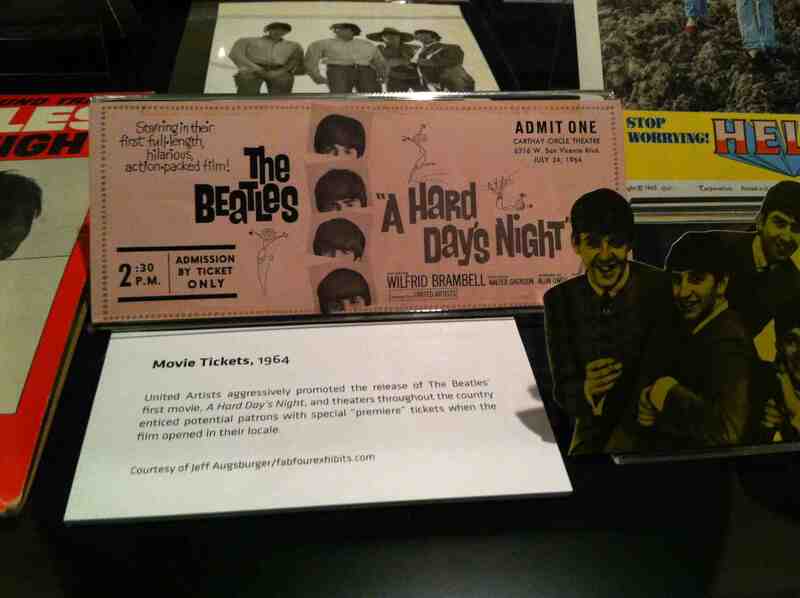 Ticket to see A Hard Days Night. What powers of perception to save this. My mother would have ditched it as soon as I got home. We had this 45 and I remember this sleeve. We don’t have it anymore. Even though these are surely worth a mint today, I much prefer wearing Jack Purcell’s. I saw one of these coin holders selling on eBay for $99. Beatle dolls, Paul bubble bath bottle, Ringo figurine. Paul and Ringo themed merchandise were the most popular. Of course, I preferred John and George. 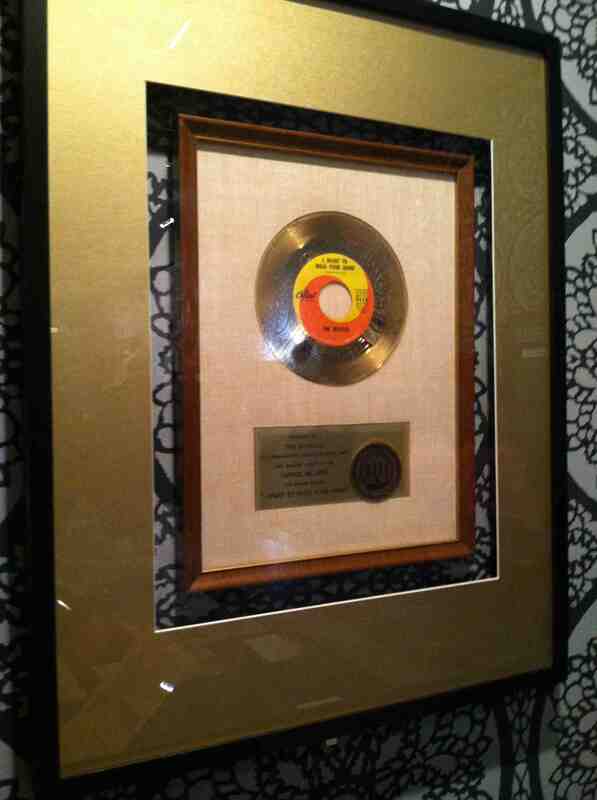 Gold record for “I Want to Hold Your Hand”. The version of this song they recorded in German gives my colleague, Godsend, hives. 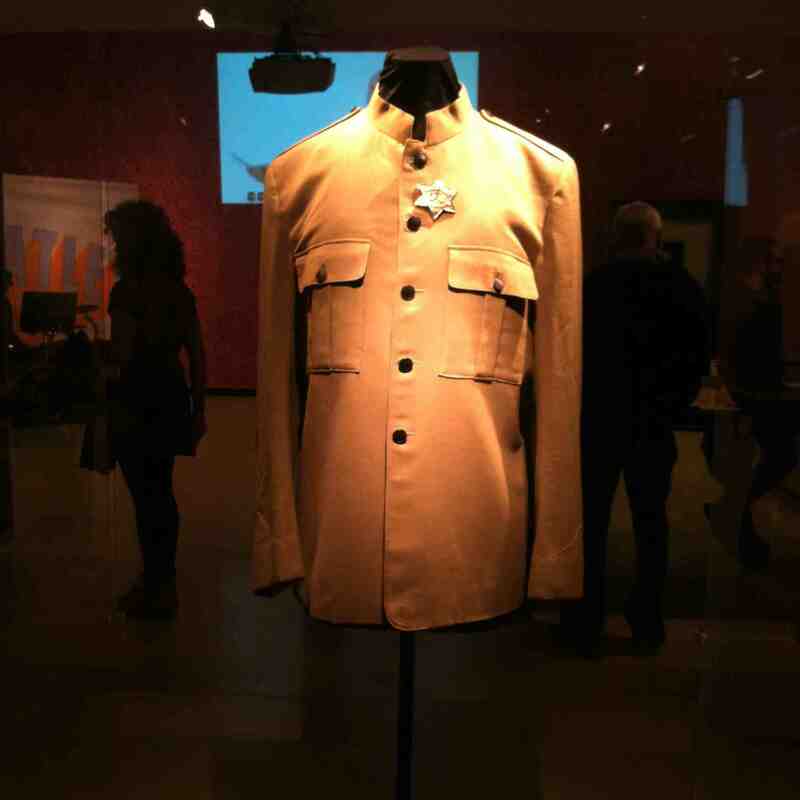 The jacket Paul McCartney wore when the Beatles played Shea Stadium. 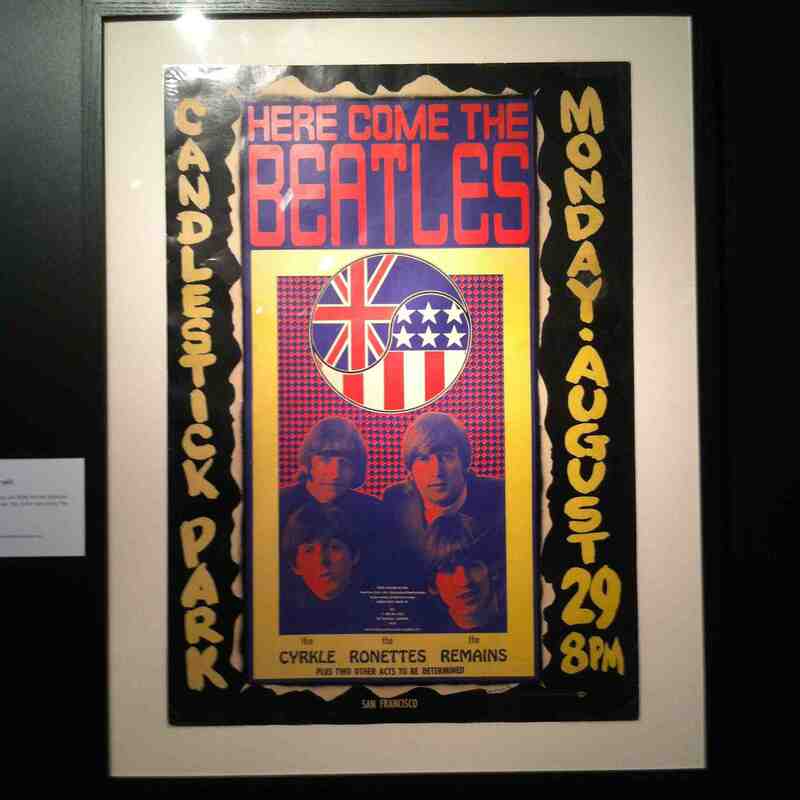 Poster for the Beatles last concert performed in San Francisco, my home town. None of us attended. Idiots. A guy born without the shame gene sitting at a drum kit taking a lesson from Ringo. Enter this booth to yammer your guts out about the Beatles for posterity. Year-round Beatle exhibit in my lair. This entry was posted in Humor, new york city and tagged british invasion, free exhibits, music history, new york public library, nostalgia, rock and roll history, the beatles. Bookmark the permalink. Thanks for the free trip to the library, greasy fingers and all. You’re welcome R. If you’re in Manhattan between now and May 10, check it out! There’s much more to it than what I’ve shown here. I think Milton would even be able to tolerate it. You’ve got that right, Cathy! It was a lot of fun. The Grammy’s have not released a full schedule of where it will move to after Minneapolis, but supposedly, whatever cities it visits, it will stick around for three months before winding down at the Smithsonian in 2016. But, someone had a good guitar for George to buy. We had tickets for Rain in Des Moines earlier this month. Alas, a snowstorm prevented travel to get there. It would have been fun. That’s a drag you missed your show. Theater is pretty unforgiving if you cannot attend. Here in New York the show always goes on even if a nuclear holocaust is underway. I think the population of Benton was around 8,500 when George visited. According to your Wikipedia link, it appears that about 1,500 lucky souls made their escape over the past fifty years. 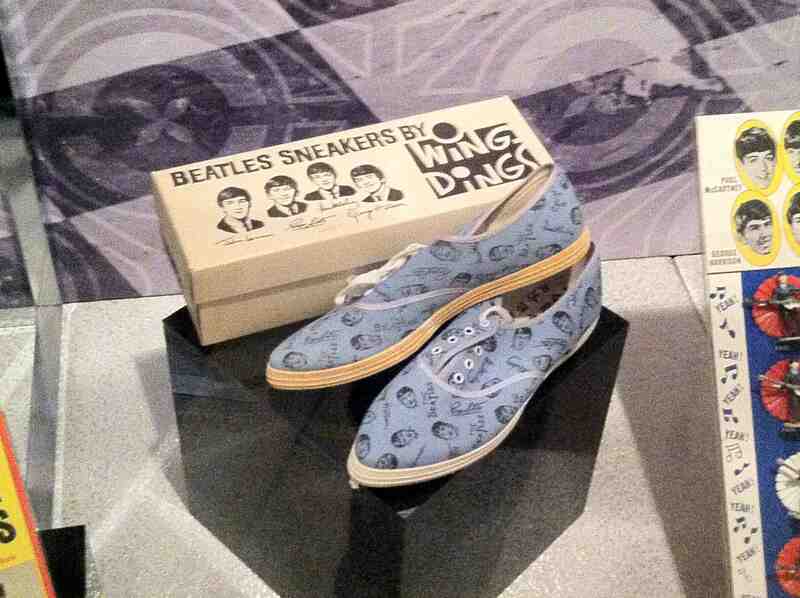 I am not a Beatles fan but the exhibit looks amazing. well done! But you are a library fan, so winter hats off to librarians! You would not be bored, Audra, the vibe is great and the price is so right. And maybe you’ll take that drum lesson with Ringo. Or maybe not. If one person visiting this exhibit would get head lice from a pair of communal headphones, hands down, that one person would be me. No thanks. Thank you for that image Uncle Festus. I watched the Grammy tribute a few weekends ago and was pleasantly surprised. Only one real dud in the bunch, Ringo is (still) a hoot, no doubt well-preserved and pickled, and Paul sounded great. Plus, Peter Frampton was in the house band! I know a woman in NYC who doesn’t care for the Beatles; she considers them a boy band. “They were boys, and in a band,” to paraphrase. She also doesn’t like chocolate. I smell Communism, or Martian. Or Martian Communist. She sounds about as pleasant as a colorectal exam Jeremy! Let me guess, she also doesn’t care for the taste of water. I’m sure this comes as no surprise — I find the most intriguing items are the set list and the song lyrics. I love anything handwritten, especially in this day and age. I highly doubt that someday we’ll be as sentimental about Bruno Mars’s iPhone notepad — for several reasons. I was thinking the same thought, Jackie! Seeing an old iPad is not the same. And penmanship is quickly becoming as extinct as the dinosaurs – not that John or Paul’s chicken scratch was on the level with those pictures you posted of those extraordinary handwritten letters on display in the Morgan Library. But yeah, it was very cool to see their handwriting. I remember Beatles trading cards (same size as baseball cards) and my cousin, Jake, even had a Beatles wig. It looked so funny on him. He was a redhead with freckles and the wig was jet black. I wasn’t real crazy about some of their early stuff, but from Sgt. Pepper’s on they were great. Super talented songwriters and outstanding muscians. In fact, last night I was sitting in the garage enjoying Abbey Road with the garage door open and a rum & coke in my hand. I love their entire catalogue from start to finish, Russell. Their music has always lifted my spirits. If I were ever drunk or dumb enough to get married, I think I’d select their comedy track ‘You Know My Name (Look Up the Number)’ as my wedding song. You know I am quite find of Coco. But she needs an extended visit to a 60s era reeducation camp. Paging Dr Mao. Milton also should know better. 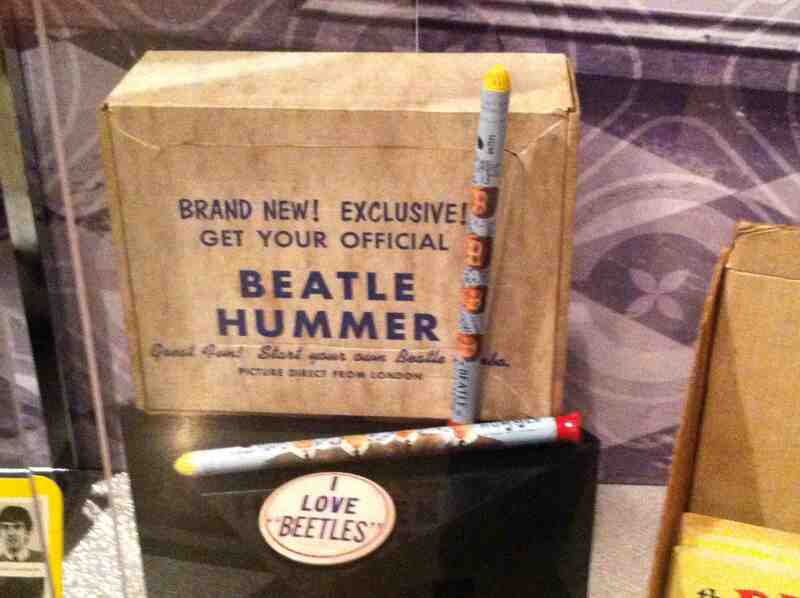 Propriety prevents me from commenting too descriptively on the above captured Beatle Hummer. But as you know I am straight, thus the thought of a Beatle Hummer doesn’t do a whole hell of a lot for me. I am looking for my Vee-Jay LP that predates all the Capiltol Records albums. Even though it had a noticeable typo on the play list. Not sure if it was on Side A or B. Is this the Vee Jay album you’re thinking of? I think I might have that one in my record collection in my Dad’s house. Or maybe it was a re-issue? Coco’s the younger generation. She likes punk and new wave. As for Milton, when it comes to white guy bands, he’s more of a Stones fan (and I got to see them in concert in 1978 — that was a great memory). His pulse races for Barbra, Sarah Vaughn and Bettye Lavette. Most of today’s singers and bands make him scowl. I feel the same way. Taste knows no age boundaries. Take note Miss Coco. I guess Milton has some excuse but I’m not going there. Without checking the link is have to say yes. The Beatles beat Meet the Beatles by a few months. Coco knew that comment in the bar about them the other night was going to bite her. What is it Milton should know better? Perhaps he just thinks Dylan is more important and doesn’t get celebrated as often. You would bring up Dylan! When you walk past the suits belonging to Ray Charles and James Brown, there’s a big glass case full of Dylan memorabilia. I couldn’t get a decent shot of that! You might want to pop in just to check out the many non-Beatles items. Thank God you didn’t push Milton over the edge and into a series of homicides I’d be hearing about all the way here in Cuenca. I’m sort of with him, I’m afraid. Just listening to CNN on the radio has brought me more Beatles stories than I’ve been wanting. Have a great week, V. Thought of you when I heard about your warm-up. Rest assured, Kathy, that Milton is keeping his water pistol holstered. I don’t have a conventional TV right now, nor do I listen to the radio so I was not inundated with all things Beatles fiftieth anniversary. Attending this exhibit has been my extent of it. And it was a treat, but I think if I got constantly hit on the head with all things Beatles anniversary, it would be a one-way ticket to the insane asylum, too. As for the weather here, the temperature is dropping again and snow appears to be back in the forecast on Wednesday and Saturday. So March could start with the white stuff. Joy. It would be interesting to see an exhibit of some current band 50 years from now because it will all be tweets and autotune (and likely hummers). Considering what current bands are like today, a server crash resulting in all the data entering the ether could be a blessing. 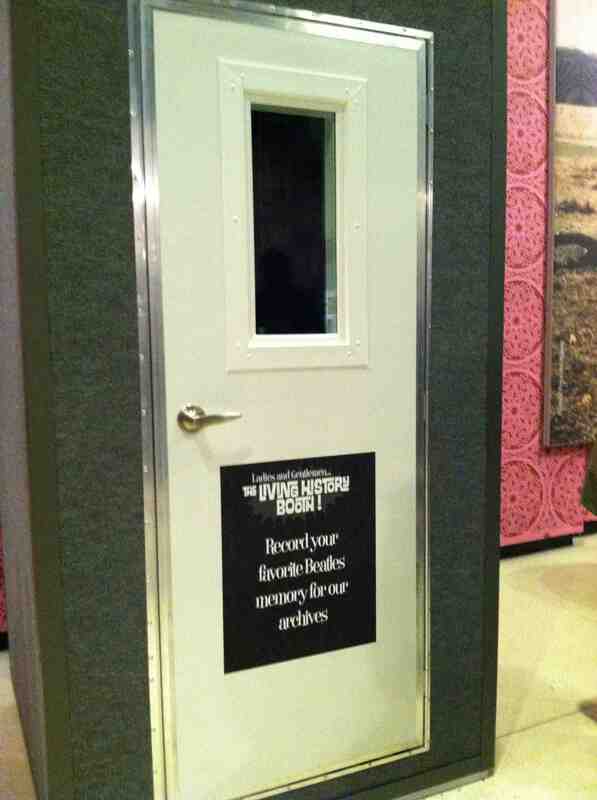 I need to visit that exhibit – somewhere – anywhere. The Beatles have always been my favorite band. My kids were exposed at a young age, whether they liked it or not. Thanks so much for sharing some of the memorabilia. It looks like nirvana to a die hard Beatles fan! You should go see it again for me. Terri, since it’s free and walking distance from my sanctum sanctorum, I probably will see it at least a time or two more. It’s a very cool exhibit that’s a lot of fun. If you have any chance to catch it, don’t miss it. There’s so much more to it than the pictures I posted. It is must-see viewing for all Beatle fans. All these for free? Exceptional education on a piece of important cultural history for you young people. Let the hype go on, I say. I’d bring my 20 something son there too if I were lucky enough to be living in the Big Apple. And, considering your frequent destination and the Beatles being your fave band, I highly recommend the movie Nowhere Boy. Maybe you’ve seen it already. Milton and I did see that one at a screening when it was released some years back. I think it might have been around 2010, around the 30th anniversary of John’s murder. I seem to recall that we also saw the American Masters film about John Lennon living in NYC at the New York Film Festival that year, too. Yoko was in our audience. How cool was that? John Lennon had written a slim volume of stories with quirky Thurber-esque drawings in 1964 or ’65 called “In His Own Write” (available on Amazon.com.) I was a senior in high school and thought they were the funniest and most subversive things I’d ever seen (which they probably were at that age.) So I took it upon myself to write some of my own in Lennon’s style. A friend of mine, the editor of our high school newspaper, really liked them and was going to publish them until our school principal got word of it. I was called into his office and given a bit of an upbraiding and told never to darken his door again if I knew what was good for me. 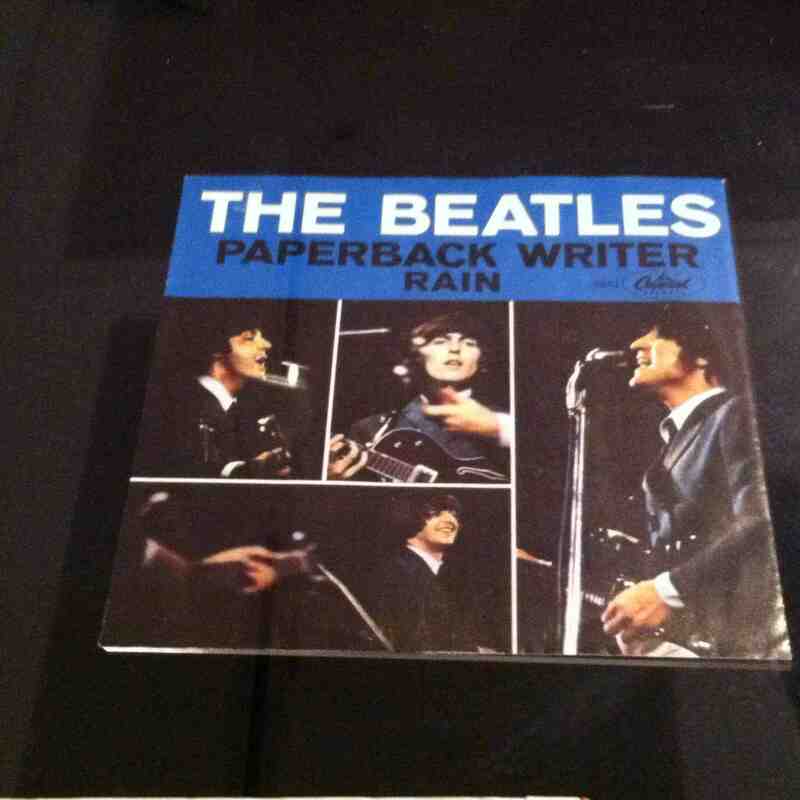 A budding writing career ended before it began…I still love the Beatles, though. That’s EXACTLY the kind of story I’m sure “they” would love to have recorded in the Beatles “Living History” booth at this exhibit. Maybe if I attend this exhibit again, I should read your comment and give your name as the author? 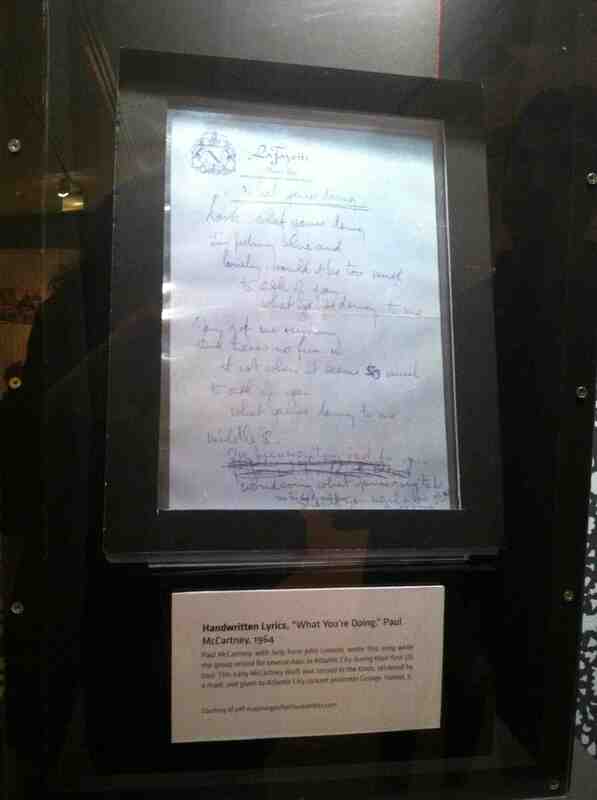 That Lennon book was also on display. I’m envious! How fun to see all of that! I’m 40 and love the Beatles, and we’re indoctrinating our kids too. I hope the exhibit comes to Portland. And what IS a Beatles Hummer??? So I looked up a Beatles Hummer: it’s a crappily made cardboard flute perfectly designed to play soggy, assume barely recognizable renditions of Beatle hits that sound much more like misses on this tune-less piece of garbage now probably worth a king’s ransom if in mint condition. Yes, indoctrinate the spawn Kylie! Ha! I was unaware the the 50th anniversary was coming up. Send Milton over here and he can live in blissful ignorance and not kill anyone. might be safer for all. Unless of course I get on his nerves. Never mind. The fiftieth anniversary came and went earlier thus month. A huge deal was made out of their landing at JFK and making their US TV debut on the Ed Sullivan Show. You should have been there and maybe you were as a molecule floating in space before your official entry into the world ten years later when disco was riding high up the record charts. “Do the Hustle” – no thanks. Thanks for posting the picture of the Pepsi radio,that belongs to me and I will not be able to attend in NYC. Hey Vintage, thanks for checking in! That’s very cool of you to visit my little site. 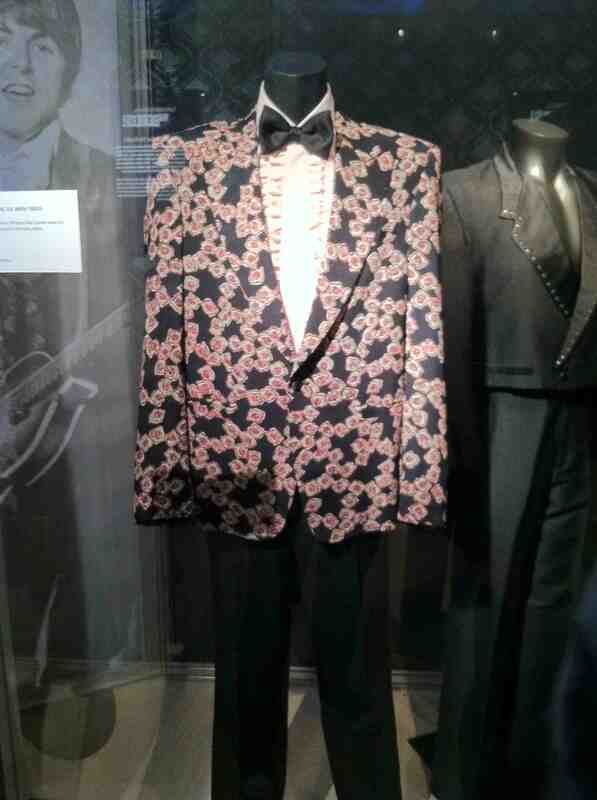 So I have a question: did this one on display belong to one of the actual Fab Four? If so, which one? Whether it did or not, it’s adorable. Does it still work? As a Beatle era person I thank you for taking the time to study history. I do love their music but I never understood the mania part of it, but then every generation has its music now. My mother has a gadget in the guest bathroom that sings “Boogie Woogie Bugle Boy,” and my granddaughters are into Taylor Swift and Micki Minaj. You raise a valid point about every generation having their own music. I think that great musical artists transcend time, but I don’t think there are many great musical artists today. For example, I would never equate Taylor Swift or Nicki Minaj with women I consider great: Barbra Streisand and Aretha Franklin, but maybe I’m showing my generation? Fifty years from now, when I am long gone, there could be an exhibit honoring Taylor and Nicki’s careers. In that case, I can honestly say that I will be very happy to no longer be of this world. No, the radio never was owned by one of the Beatles, yes it still works. It is a part of my collection that is very rare in near mint condition. Each of the Fabs were presented with one back in 1964 and I am sure they are nowhere to be found. 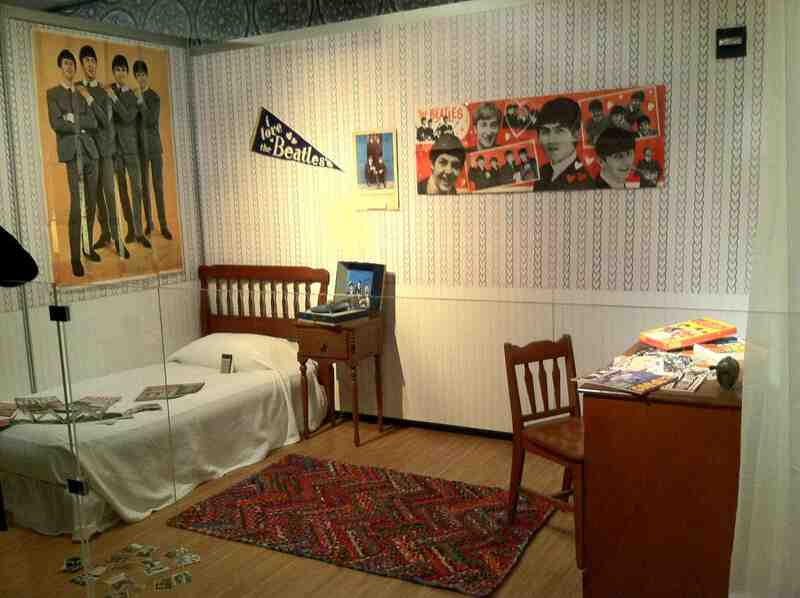 I found your site when I did a search for Beatles exhibit NYC pepsi radio,and there you were. I was in Manhattan to take apart Ringo’s Shea stadium drum kit a few weeks ago at Bloomingdales and missed the chance to see the Exhibit. Thanks for visiting! If you’re loaning your radio for the entirety of it, maybe you’ll get to see it if it plays in a city near you? It’s a lot of fun. Tom, everyone is entitled to their musical opinion over here, but as this site’s real deal Englishman, born years after the Beatles invaded America, it doesn’t surprise me that you might feel more “no, no, no” than “yeah, yeah, yeah” about them. You’re the same age as my ex, Voom, who was also a Yellow Submarine fan, but that was about it. She couldn’t even name all four of them. She blanked on George. She wasn’t British, just an American idiot. I’d have to put Yellow Submarine just after Sgt Peppers, Abbey Road, Rubber Soul, Revolver, The White Album, Let It Be, Beatles VI, Meet the Beatles, Magical Mystery Tour, Help, and Something New. Did I forget anything memorable? I was thinking of putting Yellow Submarine ahead of that one. Maybe I misjudged how much I really disliked the album and the cartoon. You like Yellow Submarine more than A Hard Day’s Night? I think I like Meet the Rutles more than Yellow Submarine, but that’s just me being me. This looks uber cool, V. I don’t consider myself a Beatles “fan,” but there are a few songs of theirs (and each of them separately) that I do like. If I had to pick Beatles or Rolling Stones, I’d choose Rolling Stones, but I certainly realize the major influence and impact they had on music. 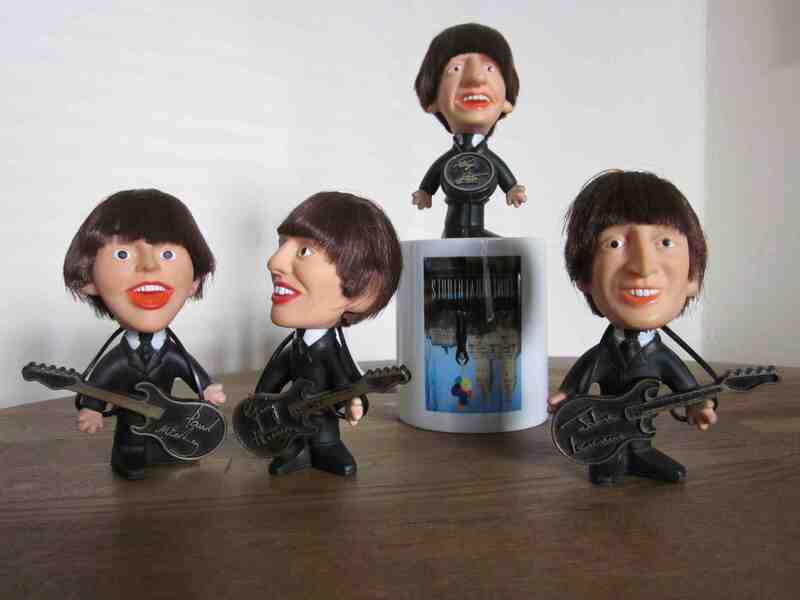 Are those Beatles in your lair bobble-heads? Do you dance with them after a good sweaty, spin session? What is your favorite Beatles song to do that to, if you do, do that? Brig, they’re not bobble heads and they’re back in the vault, so no, I don’t twist and shout with my toys. I’m a big Stones fan, too, but there are times when I think their longevity might work against them. With the Beatles, there’s a wistfulness if only John and Paul had popped into SNL on that night Lorne Michaels offered them $3,000 on air to reunite. I was watching SNL that night. Had that happened, I would have plotzed. With the Stones, there’s been the next tour every few years for 50 years. Mick Jagger at 70, and looking more and more like Don Knotts by the second, is still one of my all time favorite rock stars. I also think that Keith is very cool. I expect those guys to outlive me. They just keep on rolling. Poor Milton, but hey .. at least you didn’t push him over the edge. Your captions are always worth the read. “What the hell” was perfect. Meanwhile … I’m overly stressed … and oh crap … some cold is coming back for a few days. Is your move taking a toll on you? That must be fun-city in this awful winter. I am so sick of this weather. The weekend forecast sounds dreadful. Glad you enjoyed reading the captions! It was a fun exhibit. I feel much more inspired to get out and do something under sunny skies. Imagine that. BTW …. if I had the time, this would have been the perfect opportunity to do a Saturday morning tribute to the Fab Four. Just too much going on at the moment … the move, associated stuff, the project, and then some. Simply not a happy camper. You can always do a Saturday morning Fab Four post after you settle in. I guarantee that whenever you do that post, it will be a crowd-pleaser. If I go back to the exhibit in the not too distant future, I’ll try to remember to take a better picture of the script for you if you’d like that. I shot pictures of the Beatle inflatables based on the cartoon characters last fall when I was killing time in a toy store before getting semi-hammered with Coco. A shot or two might have come out okay. I’ll look through my archives. Ah yes … “Free” means easy return visit! … and yes, I have your heroes on my Saturday list! You’ve got that right, Frank — and this exhibit is a short walk from my sanctum sanctorum. It’s almost as if I open my apartment door and find myself entering it. Excellent! … and hope you get someone to go along! To bad I can’t come over. But maybe it will make it over to Cincinnati when it tours other cities? It would be one I would like to see … but who knows if it will make it here. The Grammy’s has not announced where it will go after Minneapolis. I find that odd. Maybe they really don’t want to tour. Hey Frank, vintage63lefty (a screen name you no doubt love), has been commenting on this post. 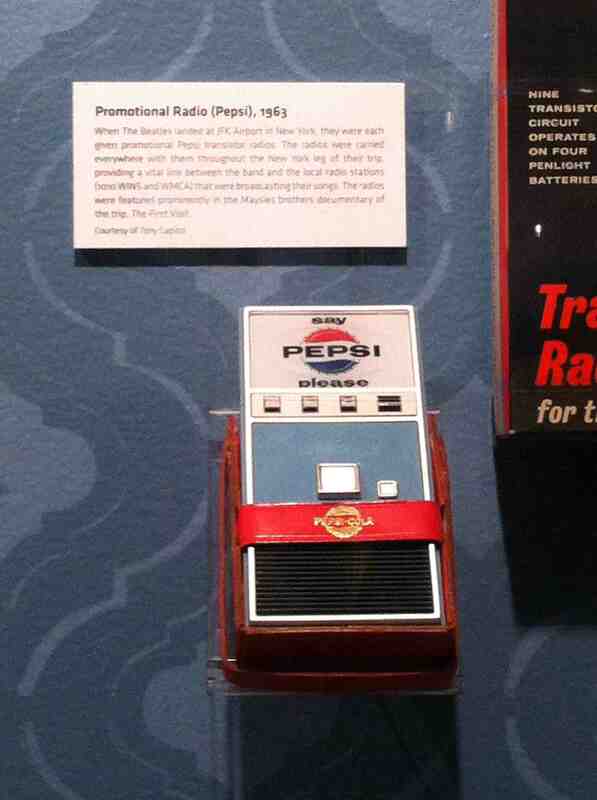 His (or her) Pepsi transistor radio is the radio on display. He (or she) has shared news about the touring schedule. After Minneapolis, it heads to Seattle, then Phoenix, then Austin. After that it might go to Little Rock before finishing in D.C. at the Smithsonian. As of right now, Cincinnati seems to not be on the touring schedule. Don’t shoot the messenger. No Cincinnati is one thing .. but nothing even close! Thanks for the scoop. Maybe you should consider visiting the Smithsonian in 2016 where it wraps? You and Mrs. AFA like to go on getaways. By then, you will be through with moving and unpacking. This is an email I received concerning the Exhibit…. The last day in New York is May 10th. Around June 1st it will in Minneapolis. The Mall of America is currently building a brand new exhibit gallery in the mall and we will be the inaugural exhibit there. After Minneapolis, it will go to Seattle (EMP) and then Phoenix (MIM), again for 13 week stints each. After that, the LBJ Presidential Library in Austin, Texas is pressing for 2 back-to-back 13 week stints. We have not signed the deal for that one yet, but it’s pending. Because of the LBJ Library, the Clinton Library in Little Rock has contacted us also about a visit. The exhibit will finish in August, 2016 in Washington D.C. at the Smithsonian American History museum. We have purposely left 2015 basically open because we wanted New York to open before we negotiated any other contracts. Thanks for sharing this vintage! 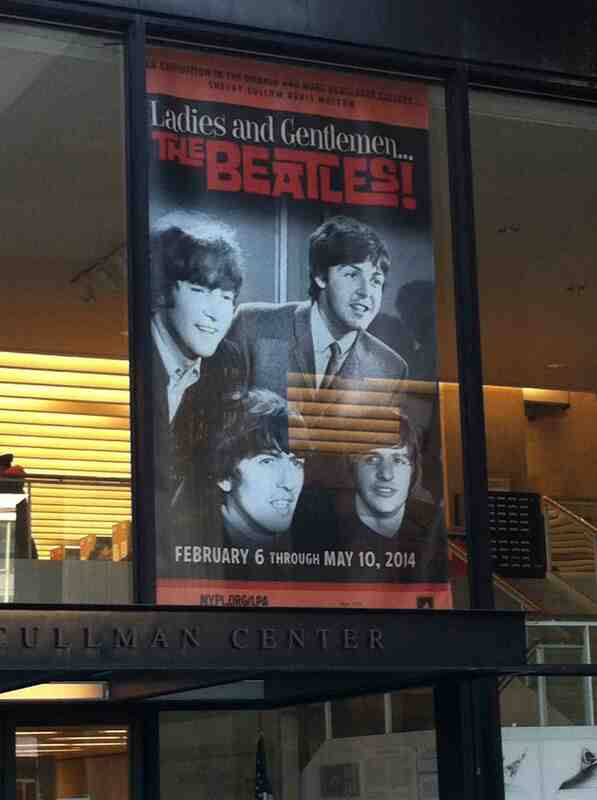 Wow, who knew the LBJ Library was so smitten with the Beatles? My sister’s husband would love that. He’s had some sort of Beatles show going on the TV every time I’ve been to her house lately. He must be one of those Beatle-worshipping guys you mentioned. And fifty years ago he was probably mocking all the girls he knew for their Paul and Ringo crushes. I am man from sunny Buffalo,N.Y. 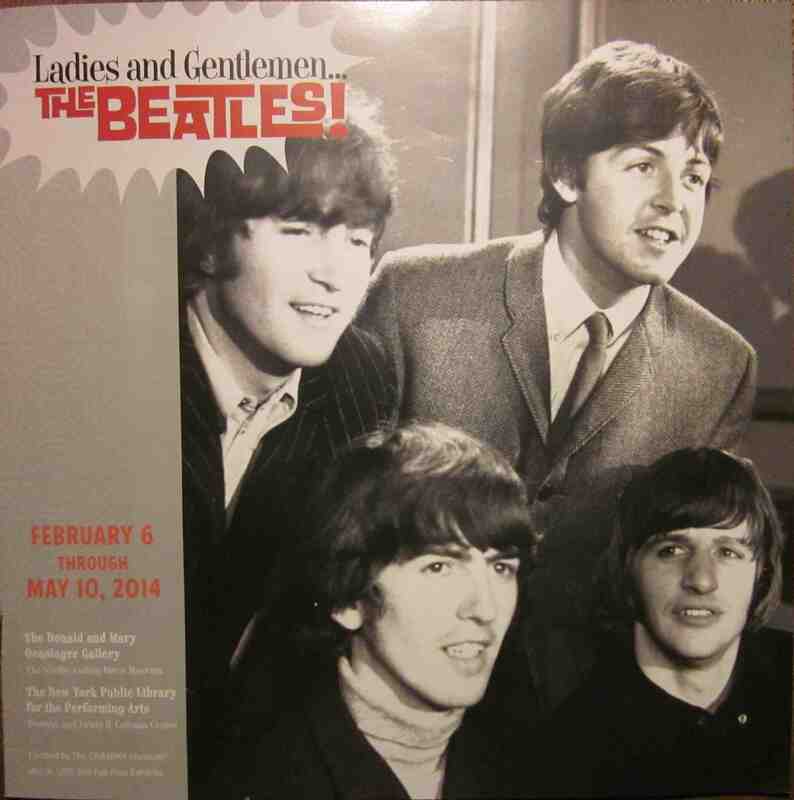 Who is a collector of vintage Beatle items. My screen name (vintage63lefty) comes from the fact that I owned a vintage 1963 left hand Hofner bass like Paul McCartney,one of 5 in the world. I have enjoyed reading the comments on your site, I love people’s honesty regarding if they like the Fabs or not. Thanks so much for visiting! I had no idea that there are only five left handed bass guitars like Paul’s in the world. If you own one, does he own the other four? Many of my commenters are quite loyal to this site — and for the most part, they are pretty articulate folks. I’m glad you’ve enjoyed reading the comments. You’ve been like a special guest here. Sunny Buffalo — love it! There were Beatles fans then there were Stones fans, I was a Stones fan. Never much cared for the Beatles in their early days. Liked them better when they became more, Abbey Road. Guess I was always a bit of a rebel. Thanks for the tour, quite good actually. I wouldn’t mind seeing it. Our Special Guest has told me that it’s eventually heading to the Lone Star state, Val, so if you’re anywhere near the LBJ library, you’ll have that chance. I am a fan of both bands. I felt very lucky to see the Stones on the Some Girls tour when they played Anaheim in 1978. Mick Jagger was 35. I recalled him saying he didn’t want to be singing Satisfaction at 40 so I feared that their touring days were nearing the end. I didn’t realize that he’d be perfectly fine singing it at 70. Paul still owns his original Hofner that he played on the Ed Sullivan show back in 1964,that being made on 28th week of 1963,mine was made before his on the 17th week of 1963. We have been told by the factory that they made only 5 but really could not confirm that seeing accurate records were not kept. Too date he still uses it on tour but Hofner did make him a clone of that bass so that he does not have to toss around the original. I was contacted a few years ago by his office requesting photo’s and information about my bass.Story has it that he had a few stolen in the early days,I have a video of him talking about it. We know of one that he had stolen for certain but that one he purchased in 1961 when he was in Germany. That must have been cool being contacted by Paul’s office even though they were probably just trying to determine if your bass was stolen goods. So Tony, are the instruments displayed in the exhibit really theirs or replicas? 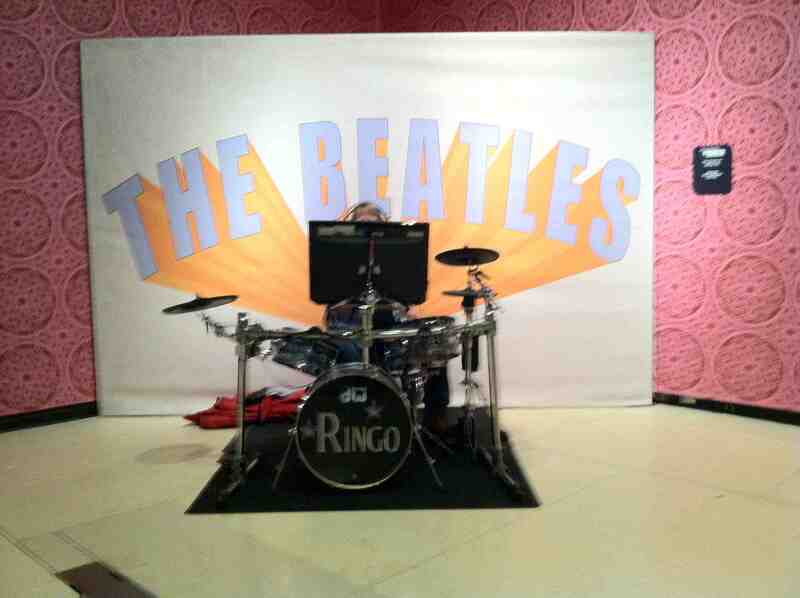 My gut feeling is they’re replicas, but the Ringo drumheads locked in glass I assume are real. As you noted the drum head in the glass is original, it is the one used on the Ed Sullivan show and is owned by a friend of mine Russ Lease, he purchased it in 1996 from Christies auction house. The display with instruments are reissue guitars however, the drum set is an original 1965 Ludwig set like Ringo;s…that is also owned by a friend of mine Gary Astridge,another Buffalo guy. Gary has been documenting Ringo’s kits and was part of the setup at the Grammy Museum in LA. 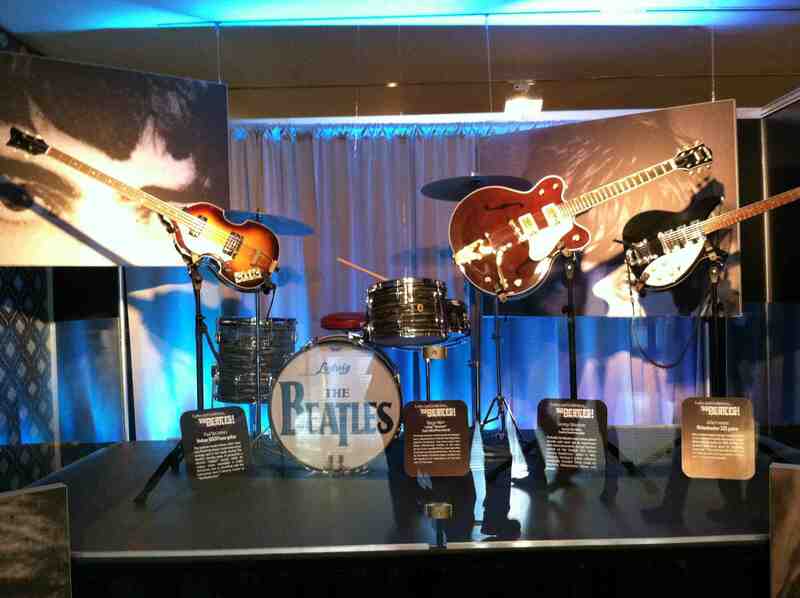 I was lucky too make the trip to LA with Gary and watch them put together the display, we were invited to attend the Grand Opening and meet Ringo that day. The next day I had a front row seat at the press conference Ringo had and made sure I took plenty of pictures. I guess as a Beatles fan I have been pretty lucky fellow. That sounds great, Tony! When I first moved to New York almost 32 years ago, I used to occasionally see Yoko in my neighborhood (I live on Manhattan’s Upper West Side, not far from the Dakota). She’s the closest I’ve ever come to seeing any member of the band. Because it wasn’t very long after John was killed, she looked depressed. I never intruded. I respected her privacy and her space. I don’t see her around anymore, but when the American Masters documentary about John living in New York played the New York Film Festival in 2010, she was there in our audience. That was very cool. She got a standing ovation. It was a very emotional night. I loved the Beatles and owned the Blue Album of greatest hits. “Across the Universe,” is one of my faves. The movie, Across the Universe. I’ve missed that film, Susie, and it’s possible that I will never see it because I much prefer seeing films on a movie screen than on TV or streaming on my computer. I know ATU features Beatles’ songs, but I don’t think of it as a Beatles film. But that’s just me and I think it’s fine that it resonates with you. I’m not a fascist … Or that much of a fascist. I was at McGill, in first year uni, when the fab 4 first appeared on the Sullivan show and I can recall all the details of about 40 of us crowded into the tv lounge in the girls’ residence. The tv was probably the size of my computer screen today. I even remember what I was wearing, for some weird reason. I had all their albums, now in the possession of one of my sons who still has a turntable, and confess their music was to blame for my less than stellar marks that year. We had to party! Thanks for sharing our memories of that night fifty years ago, Patricia! I recall what I was wearing when I watched them on Ed Sullivan, too. My flannel jammies. Hey, I was only pushing age five, but I was happy as a loon to see them. It was a very exciting night. Thanks for sharing the photos and history! The Beatles broke up when I was a child but I latched on to their catalog as a teen and never let go. I live in fairly close proximity to this area of Tennessee and got a kick out of that story. Hey, thanks for visiting, commenting and sharing the link to Paul and Linda in Nashville! That’s very cool. That recording session he did in 1974 prompted me to listen to Paul’s dad’s song on YouTube. It looks like it took a while (15 years?) to get released. Too bad it failed to chart. That exhibit was so much fun, Guat! As for me singing, the only thing I’m personally capable of doing with a tune is dropping one. My voice is about as melodic as a dying antelope groaning. Ha! But I bet it still would have been a hilarious experience. Dude I hope the exhibit comes to my neck of the woods 🙂 I love free. Free is my second favorite four letter f-word. Holy smokes, Lame, have you ever had as many comments on any other post as on this one?!? Ha, Jeremy! I suppose this post is more proof that the Fab Four remain a crowd pleaser 50 years after crossing the pond. I love them so much! Thank you for writing about this! I was so excited to see some of their stuff at the Hard Rock in Budapest, but your experience sounds so much better! It’s a fun exhibit, that’s for sure. Thanks for visiting and commenting! Lame,glad seeing this thread still getting hits…The Beatles Rock !! The Fab Four have been very good for LA. been pulled and taken to Julien’s Auction House.The fellow who purchased it a number of years ago decided to sell it. Whoa! Thanks for the update! I should re-visit just to see what’s replaced that guitar.